If you’ve been waiting for the next book in the Baba Yaga series, the wait is over! 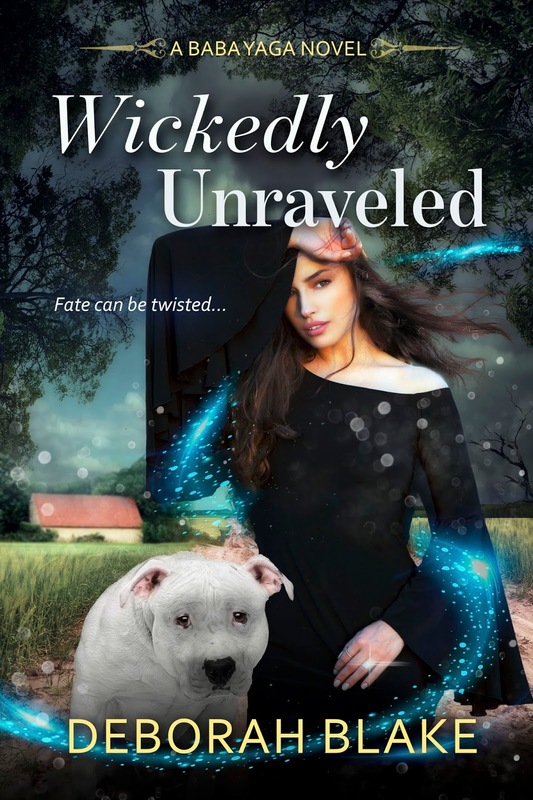 Yes, today is release day for WICKEDLY UNRAVELED. I hope you’re as excited as I am. This book is based on an idea I submitted a couple of years ago, when the Baba Yaga series was still being published by Berkley. But when they decided not to continue with the series, I figured it would never get written. Then I self-published the final Broken Riders book, DANGEROUSLY FIERCE, followed by a novella (Dangerously Driven) and it turned out that my readers wanted more. Yay for my readers! My readers rock. I loved writing this book because I got to return not just to the world of the Baba Yagas, but specifically to Barbara Yager, who I confess was my favorite of them all (shhhh, don’t tell the others). When I told my agent that I wanted to write about Barbara again, she said, “You can’t do another book about a character who has already gotten her happily ever after…a married one to boot. That just won’t work in romance.” Then she saw what I had figured out, and basically called me an evil genius. Snicker. The Baba Yagas have incredible power, but even that may not be enough to save their world when magic goes horribly wrong and all their happily ever afters are gone in an instant. Barbara Yager is used to traveling alone as she tends to her duties as a Baba Yaga. She sometimes brings Babs, the adopted daughter she is training, but her sheriff husband stays behind. This trip, though, she has made an exception. After all, the task seems so simple, and shouldn’t take long to accomplish. When it is done, the three of them can indulge in a long-overdue family vacation. What could it hurt? Quite a lot, as it turns out. 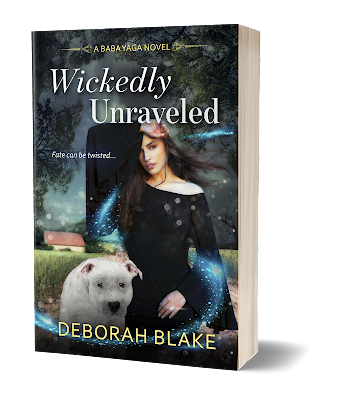 What Barbara thought was a minor problem ends in a violent magical confrontation she never expected. The resulting backlash sends them all into a warped timeline where Barbara and Liam never got together, and only Barbara and nine-year-old Babs remember the truth. Liam is still trapped in his grief and all the good they’ve done together in the past few years has come undone. Even worse, her Baba Yaga sisters, Beka and Bella, don’t believe her, and the wicked Brenna is still out there, planning who knows what kind of mischief. The children stolen by the rusalka Maya are trapped in the Otherworld and she is loose in this one and up to no good. It is up to Barbara, Babs, and their faithful dragon-dog companion Chudo-Yudo to knit together the unraveled timeline and make things right again, before it is too late and Barbara loses her one true love forever. Will Barbara get her happily ever after back again? You’ll have to read the book to find out! It’s available in both print (Amazon only) and eBook from all the usual online retailers, and you can also request that your library or local Indy bookstore get a copy. Of course, because I’m me, I’m doing a huge giveaway to celebrate! Welcome back to the world of the Baba Yagas—I hope you have as much fun reading WICKEDLY UNRAVELED as I had writing it. I'm so excited that there is another book! Thank you! I'm not sure if this will be the last one or not, but I was glad to be able to write it. I haven't read them yet but am looking forward to them. I visited to the site and looking forward to reading this! So absolutely delighted! Just ordered print edition!Arriving on the 23rd! Hooray! Congratulations! I'm very excited for the new book , can't wait to read it. This is a new series to me. Would really like to read more about Baba Yaga. I visited your Patreon and I'm excited to read this book! I retweeted your blog post (at least I think I did!). Love your books! *smooches* You are such a great cheerleader for my work, and I really appreciate it. Auto-bought! Can't wait to read it. Looking forward to this new Baba Yaga adventure! I haven't read Baba Yaga books yet. I’ve read all the Baba and Rider books! So excited about this one! I am so excited for Barbara to be back. She has been my favorite character from the beginning! Although I love all of Deborah's books, I am happy she brought back the original character. I sure do hope PLEASE that you can keep writing this series, as I NEVER want it to end!!!!!!! I'm so glad you like Barbara. She has a special place in my heart too. And I'll keep writing them as long as my readers keep buying them! I've read all of the Baba Yaga & the Broken Rider books. I'm wickedly excited for a new one! Thanks! Yes, I'v read the other Baba Yaga books. I am super excited to revisit Barbara! I have visited the Patreon page. I can't wait to read this!!!!! So happy about this book!!! I’m excited for this one. Would love to read. Visited your patreon page. Looks like a fun series and I checked out your patreon page. I bought the book on release day. I plan to read it this weekend while recovering from dental surgery. Happy Spring. Yikes! I hope the surgery goes well and your recovery is quick. Oh, and I visited your Patreon page.